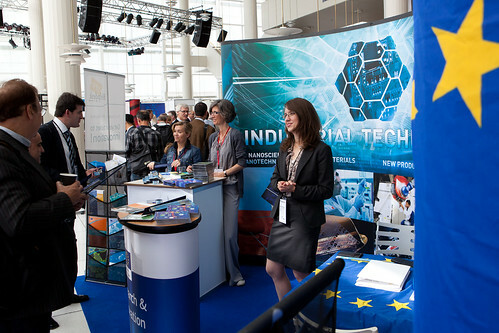 Over 800 people from 37 countries attended from 19 - 21 June 2012 Industrial Technologies 2012, which spotlighted new innovations and technologies leading the way for Europe's growth & competitiveness. The highlight was the signing of the Industrial Technologies Declaration and the Award Gala presenting the finalists of the best projects funded under the European Commission's Industrial Technologies FP 5, 6 and 7 programmes. The exhibition, poster session, site visits and the matchmaking day completed the numerous plenaries, sessions and workshops. You can download presentations in the event section by clicking on a session: you will find the presentation between session description and speaker profiles. Or, you can find them directly in the speaker profiles. "Nanotechnology Innovation: From research to commercialisation - the bridge to Horizon2020" focuses on the commercialisation of nanotechnologies, exploiting its potential for new applications and taking them further from enabling technologies to end products. With Horizon2020 beginning in 2014, the conference will show how nanotechnologies fit into the new structure within key priority areas of Excellent Science, Industrial Leadership and Societal Challenges. The event will not only feature plenaries, sessions and workshops, but also a Matchmaking Day, the magic materials NanoLab, an Exhibition and Investor Forum. Moreover, the winner of the Best Researcher Award 2013 will be nominated. To receive the latest news on ENF2013, click here to sign up. 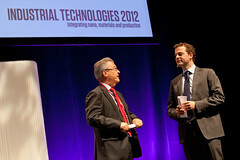 Thank you for making Industrial Technologies 2012 happen and spending some exciting days with us in Aarhus! The Award Gala's highlight was the nomination of the winner of the Best Project by the gala attendees. Out of 60 applications, the 10 finalists presented their work at the event. The winner is the IMPULSE project - Congratulations! Read more and watch the videos and impressions of the gala. Representatives of industries employing over 19 million Europeans have underlined on 21 June 2012 the critical importance of industrial innovation as a route to European economic recovery. They stated their willingness to contribute and engage with governments and the research community in the field of manufacturing, automotive, construction and the process industries to ensure this is achieved. Over 85 organizations show-cased at the exhibition. One could see additive manufacturing, robots and nano technologies as well as the latest research and the ManTra truck. We thank all our exhibitors and visitors for their attendance of the fair. See some impressions of the exhibition. The event takes place during the Danish Presidency of the European Council in Aarhus and is jointly organised by iNANO, CIP and Spinverse. It is supported by The European Commission Directorate for Research & Innovation and listed under the grant agreement number 290567.